Spin and Win Craps - Roll The Dice and Discover Your Fortune! 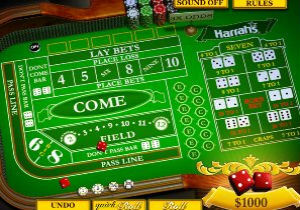 Craps is a well known casino table/dice game in which players throw dice in turns while betting on the outcome of the dice. But Craps is not all about luck since a great deal of skills and strategy is involved. Spin and Win Craps is the game of craps at Spin and Win Casino. It features a multiplayer craps table game in which several craps players can gather round a certain table and play Spin & Win Craps. Nothing beats the excitement players can get when playing Spin and Win Craps. No matter which way a player plays craps, whether by luck or skills, joy is guaranteed to all sort of players. In case players wish to play Spin & Win Craps and other Spin & Win Casino Games, all they have to do is go over to Spin and Win Download page and download the Spin and Win Casino desktop application and have it installed on their PC. Once done, players will be guided to register an account using one of many Spin and Win Payment Methods and from that moment on the players can access Spin and Win Craps and other games. It is without a doubt one of the most popular table games at Spin & Win Casino. There is also another way to have access to Spin and Win Casino and that is via the instant option which lets players play Spin & Win online casino without having to download and install the desktop application. Once a player registered an account with Spin and Win, he or she will be prompted to the Instant Play option which works with just about any web browser as long as it supports flash. This way players can access Spin & Win and play Spin & Win Craps from anywhere and whenever they feel like. If there is anything else you wish to know about playing Spin and Win Craps and other games, if you’re having trouble registering or if you require our customer service or technical support, contact us and we will do our best to assist you. © 2019 Spin & Win Casino. All Rights Reserved.